In 2008, when gasoline prices were around $4 a gallon, I went looking for a new car. “What about these Mustangs?” I asked the dealer. No one was buying the gas-guzzlers back then because the thought was that oil was going to $200 a barrel. Of course, now car companies don’t sell econo-boxes and have re-geared for big trucks and SUVs. The simple truth is that oil is cyclical. This time is not different. Today’s low oil prices will create tomorrow's high oil prices. Which makes Schlumberger (NYSE: SLB) the contrarian dividend buy of the decade. 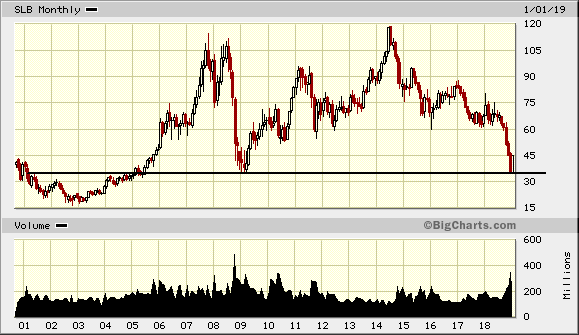 It hasn’t been this cheap since 2009... the last time oil crashed. Schlumberger is the world's largest oilfield services company. It employs 100,000 people from 140 companies and is ranked 287 in the Fortune 500. SLB provides services such as seismic acquisition, well testing, and directional drilling, as well as a vast array of energy production solutions. When the price of oil is going up, SLB does great business and the share price pops. When oil prices fall, profits fall and the share price drops. 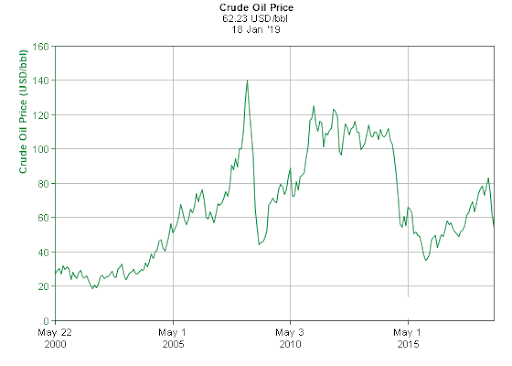 Here is the Brent oil price chart going back to 2000. You can see it leads SLB’s stock price. OPEC released its Oil Market Report in recent days, which showed that the cartel slashed output by 750,000 bpd in December – sharp reductions that came before the deal even went into effect. But that’s just the start. OPEC plus Russia have agreed to take 1.2 million barrels a day off the market for the first six months of 2019. Furthermore, new international regulations on marine fuels come into effect on January 1, 2020. This will end the use of dirty bunker fuels and replace them with cleaner midrange distillates. 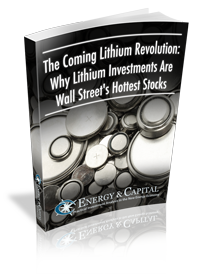 SLB recently reported EPS of $0.36. This represents a decrease of $0.10 sequentially and $0.12 when compared to the same quarter of last year. Fourth quarter revenue of $8.2 billion decreased 3.8% sequentially. Pre-tax operating margin decreased 172 basis points to 11.8%. Pre-tax operating margins were flat at 22% compared to the previous quarter. During 2018, SLB returned $3.2 billion of cash to shareholders through dividends and share buybacks. During the quarter, the company spent $100 million to repurchase 2.1 million at an average price of $48.44. The company generated $5.7 billion of cash flow from operations for the full year 2018 and $2.3 billion during the fourth quarter. Free cash flow was $1.4 billion for the fourth quarter and $2.5 billion for the full year of 2018. Despite falling oil prices, for full year 2018, consolidated revenues grew for a second year in a row, increasing 8% over 2017. Looking forward to 2019, we expect the supply and demand balance sentiment and the oil prices to improve over the course of the year, as the OPEC and Russia cuts take full effect. The lower activity in North America land in the second half of 2018 impact production growth, the dispensations from the Iran export sanctions expire and are not renewed and as the U.S. and China continue to work towards a solution to their ongoing trade dispute. So far in January Brent oil prices are already up around $10 supporting this improving outlook. Not surprisingly, the recent oil price volatility has introduced less visibility and more uncertainty around the E&P spend outlook for 2019, with customers generally taking a more conservative approach to the start of the year, again delaying the broad based recovery in the E&P spend that we expected only three months ago. However, from our customer discussions, we are seeing clear signs of E&P investment sentiments starting to normalize in the various parts of the world and heading towards a more sustainable financial stewardship of the global resource base. This is in line with my thoughts regarding the price of oil. Add to this the upside in demand due to the ending of the Chinese trade sanctions, and you have a nice buy at a low price. SLB has strong cash flow, a forward P/E of 24, low price-to-book of 1.74, and pays a fat 4.83% dividend rate. Given its historical trend, if the price of oil moves higher, you could double your money in the stock while getting paid to hold it.